Late last summer some gallery club veterans, ARTnews interns, and new friends of Niborama visited the cutting-edge, social-media-savvy mind-provoking design show at MoMA, “Talk to Me.” The theme of the exhibition is “the communication between people and things”–how all those electronic devices we rely on are specifically designed to foster emotional, sensual, or intellectual connections with their users. That includes whatever device you are reading this on now! The exhibition, up through November 7, looks like one the set of one of those movies where the future is set in the present, and maybe the robots got a little too powerful. 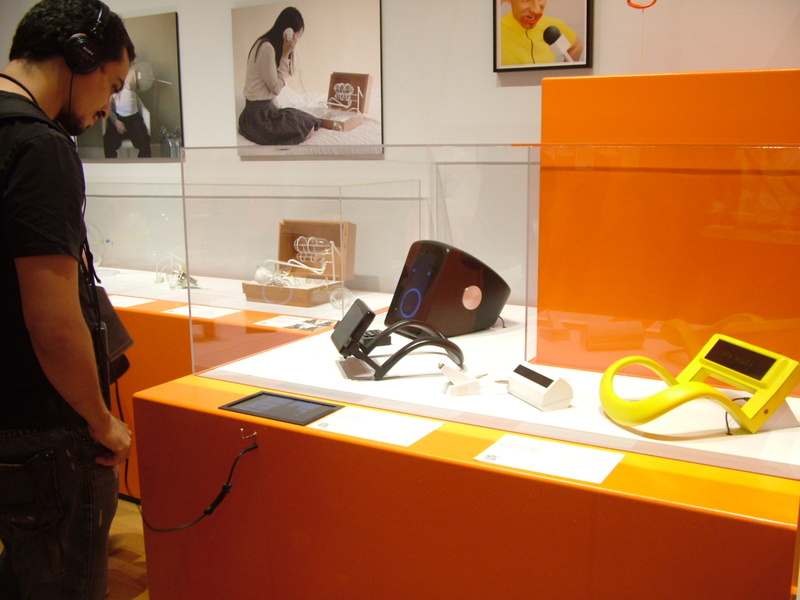 Lured by edgy animations, seductively dangling headphones, and a cacophony of computerized chatter, our group soon dispersed to various corners of galleries to experience close personal encounters with various objects. The assignment: to pick one work, describe it, and assess its potential impact–not so easy, given the high concept and multiple electronic components of the show’s contents. Our team’s choices ranged from a device that harnesses new technology to allow paralyzed people to draw–to works that comment a bit more snarkily on the creepy potential of a new reality in which we’re plugged in all the time. Never want to answer “How’s school?” ever again? 27-year-old London based Interactions Designer Gerald Ralló is the creator of a device that in my opinion has to be one of the most amusing things since my blackberry without the annoying trackball, the Reiterative Communication Aid. At first glance it reminded me of one of those Etch-and-sketch toys that I use to love as a kid. So the connection to one of my vivid childhood memories was just enough to keep me staring at a screen that displayed a video of the device. The way that it works is that you wear it around your neck and it shows a screen that tracks your conversations over time. Once a back-and-forth pattern is established, the screen reiterates automatic answers to your questions so that the wearer doesn’t need to. Apparently the device was designed in an effort to avoid those pointless conversations that we somehow get dragged into. Something that I’m pretty sure most of us can relate to, so how convenient can this device get, right? What made this piece interesting to me was the fact that each year some new device is established and every few years some form of social media is as well, and I felt as though this project brought humor to that. But the overall message that I got from it was that in a few years our world is going to be so technologically advanced that we will no longer need to have human interaction. That instead we can interact with our computerized devices to avoid odd conversations. Which seems appealing for the moment, but how appealing can it get? The device in a way begins to think for you after a while, and in addition to that it reiterates bland answers. So to answer the question, it depends, if you’re the anti-social type it can be extremely convenient. Situationist (2011) Ben Carey, Henrik Delehag, John-Henry Barac, Sohrab Salehi, Ali Nadalizadeh, Soroush Khodaii. To allow its users to escape the prescribed routine of city life, the Situationist app, developed by Benrik, facilitates real-life interactions between users. Participants create a profile with an identifying head shot and a self-generated list of situations that they are willing to perform with others. Using GPS technology, the app sends a message alert when another participant is near. The message includes the other participant’s identifying profile and the situation to occur. Situations range from the commonplace, such as whispering secrets, to the extreme–notably overtaking a television station to spark revolution. Urban dwellers are hard-wired to remain anonymous and avoid contact with strangers, so the app might provoke anxiety in some. Like the Situationists, the group of avant-garde intellectuals that is the app’s namesake, the Situationist hopes to make “your everyday life more thrilling and unpredictable.” While your aims may not be revolutionary, you can still take satisfaction in throwing a wrench in the workings of capitalism, or at the very least, bringing on the unexpected. 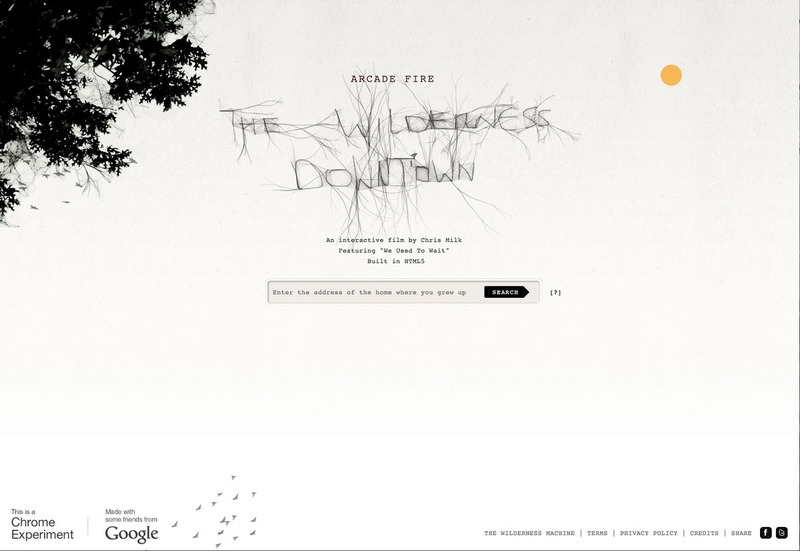 Wilderness Downtown (2010) Chris Milk, Aaron Koblin, Google Creative Lab, Mr.doob, B-Reel, @radical.media. The Wilderness Downtown is an “interactive film” by Chris Milk that uses an Arcade Fire song, We Used to Wait, as its soundtrack. You are prompted to enter your childhood address –allowing the film to load images off Google Earth to incorporate into the video. Although at first I was slightly hesitant to enter my address at such a crowded exhibit, curiosity got the best of me, and I was happy I chose to experience it. The video combined images of simple black birds, a hooded figure running, and snapshots of the neighborhood I grew up in. At first glance the images appeared to occur randomly. But on closer inspection I realized that the hooded figure had also been imposed onto the images of my neighborhood and he was actually running down my street. Watching this video proved to be more emotional than I expected. Being a college student and living on my own over the summer, I rarely had the opportunity to spend time in my family home–and here I was, sharing it with complete strangers. As the video neared the end it asked me to write a “postcard of advice to the younger you that lived there then.” The birds that consistently appeared throughout the video then invaded the postcard and made their way toward an image of my home, as if they were carrying the message for me. At the end of the video, the birds descended on my home, and with them came primitive trees. At first there were only a few, but eventually these trees consumed my neighborhood until it was no longer visible, and began to resemble a wilderness. 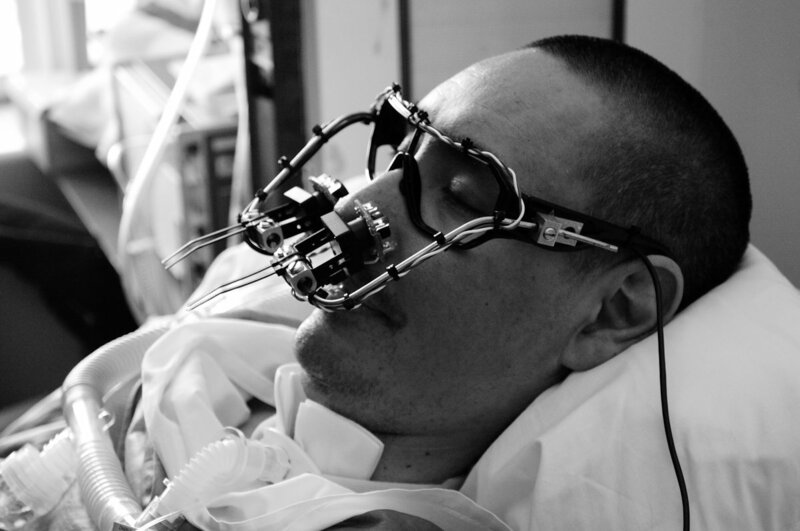 EyeWriter (2009) Zach Lieberman, James Powderly, Evan Roth, Chris Sugrue, Theo Watson. Photo credit: Eyewriter team. As the number of people we see attached to their smartphones increases, we forget that sometimes machines can help us communicate in more than just 140 characters. The Eyewriter is one such tool. It tracks one’s eye movements and transfers the motions to a computer, which in turns translates them into lines and actions in a program. It restores a person’s ability to create and communicate. For TEMPT1, a prominent graffiti artist left paralyzed by ALS (Amyotrophic Lateral Sclerosis,) the Eyewriter has helped him continue to make his art. 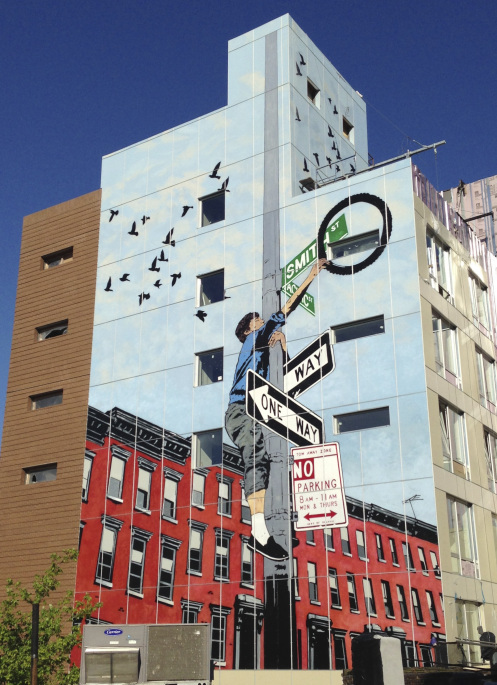 His tags are often projected unto the sides of buildings at unreachable heights, often being live-streamed as TEMPT1 creates them. These projections drip with paint, making the illusion very realistic. The very idea that a paralyzed man is able to make and display his art from his bed is very intriguing. Most of the time the machines around us are created for medicine or space, but the Eyewriter shows its capabilities as an artist’s tool. It showcases the communication between man and machine, rather than man to man through machine, and that’s what makes it more special than most other parts of the exhibit.